So, you’ve successfully migrated a few Virtual Servers Guests to Windows Server 2008 running Hyper-V, but now you want to manage the Hyper-V Server remotely from another Windows Server 2008 or Vista box. Is it possible? Today at work I had that very question, and I found it is possible and easy to configure a Windows Vista Client OR a Windows Server 2008 box to remotely manage a Microsoft Hyper-V Server. Below are the steps for enabling remote management on a Windows Vista Client. Checkout this Article if you want the Step-by-step from a Windows Server 2008 box. 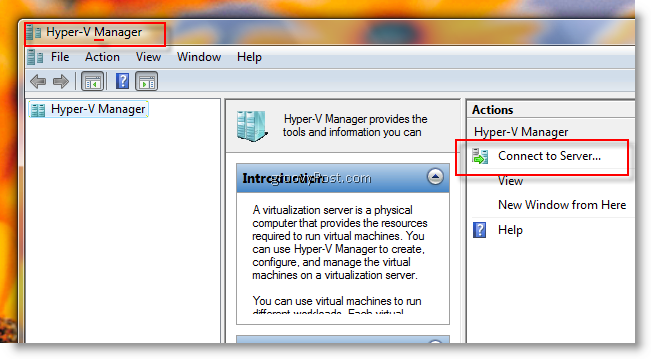 2) Click Windows Start Button, Type Hyper and Click Hyper-V Manager once Windows Search Finds it. You can also find it under Control Panel Administrative Tools. All done! Very simple, easy and most importantly, GROOVY. As mentioned above, if your looking for the steps for Windows Server 2008, checkout this article here. Thanks Ryan! Updating the document now. Thank you for the FYI and new links! Thanks for sharing this tip! I have just spent an hour trying to figure out why I couldn’t control the mouse inside the VM when I was remoting to the Hyper-V server. Now I have the control of the mouse!!! I was recommended this web site by way of my cousin. I’m now not sure whether this publish is written by way of him as no one else recognise such targeted approximately my trouble. You’re wonderful! Thank you!